Fill with 6 CE Tech snap-in inserts (sold separately). 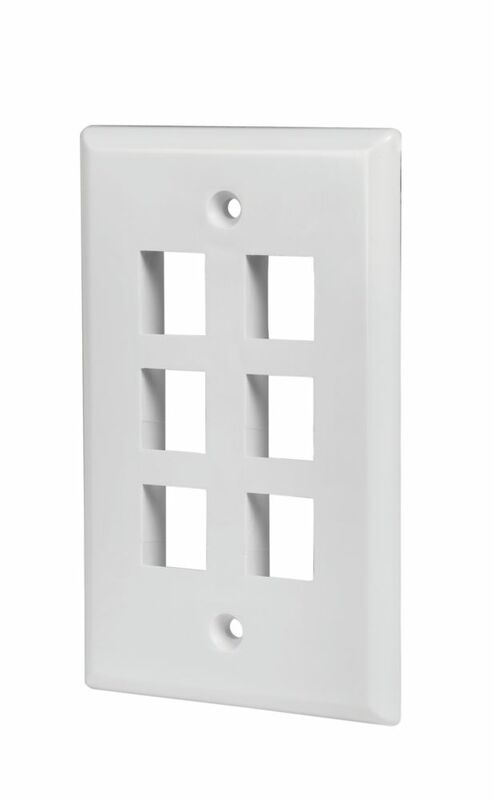 Leviton's 2-Gang Thermoset Duplex Device Receptacle wall plate is photo electrically colour-matched to other Leviton Decora devices and is designed for high dielectric strength and arc resistance, as well as resistance to fading, discoloration, grease, oils, organic solvents, and moisture scratches. The Decora 2-Gang Screwless wall plate's sleek smooth contemporary architectural styling enhances fine dicor. This exclusive new design eliminates sub plate screws, while "Hook and Snap" sub plate and wall plate mounting provides easy, time saving installation. The 3-Gang Thermoset Decora GFCI Device wall plate features a smooth face and rounded edges which resist dust accumulation. This wall plate is also photo electrically color-matched to other Leviton Decora devices and is designed for high dielectric strength and arc resistance. Available in ivory, black, gray, brown, and almond. Leviton's 1-Gang Thermoset Duplex Device Receptacle Wallplate is designed for high dielectric strength and arc resistance, as well as to resist fading, discoloration, grease, oils, organic solvents and moisture scratches. Comes in ivory. 6-Port Wall Plate in White The CE Tech 6-Port Wall Plate is used to install low voltage keystone inserts to a desired location. The wall plate's low profile design mounts flush to the wall. CE Tech snap-in inserts easily snap into the port of the wall plate.